When the sun goes down, Halifax’s waterfront and Northwest Arm provide the perfect setting for your dinner cruise. 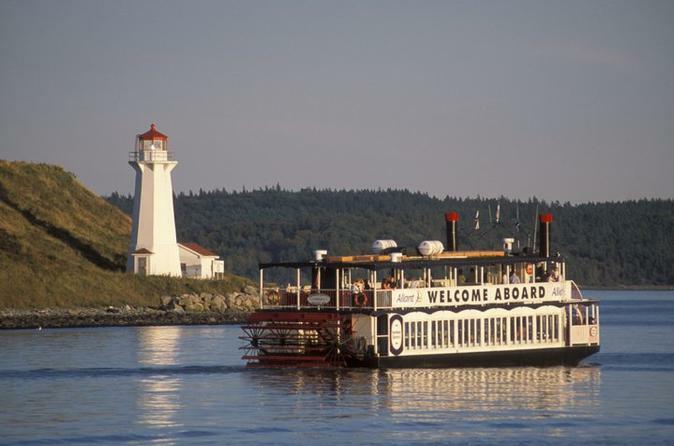 At the ferry terminal, step aboard the Harbour Queen I, an elegant Mississippi-style sternwheeler, for your 2-hour journey along Halifax Harbour. Enjoy light commentary from your crew on the main attractions along the way. At the southern tip of the Halifax peninsula, hear about Point Pleasant Park, a historical 190-acre (77-hectare) wooded area, and find out how much Halifax pays the British government to lease this land. Admire stately homes situating along the waterfront, not easily visible from land. If you look below, you might spot a porpoise or seal riding the waters with you. The Harbour Queen I turns around near the Dingle, formally known as Sir Sandford Fleming Park. Catch sight of Dingle Tower on top of a grassy knoll and learn about the park’s history. When you’ve had your fill of dinner, purchase a cocktail from the fully equipped bar and head out with your family or friends to the open-air upper deck. Feel the sea breeze, listen to the music playing in the background and watch ships sail by.